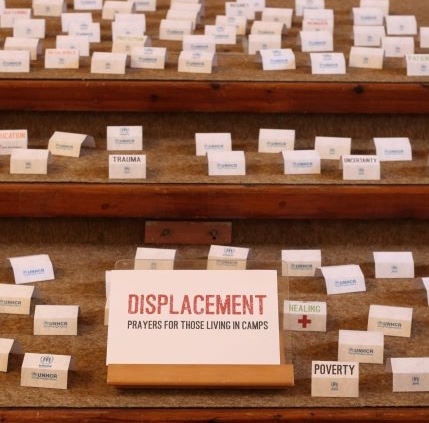 A new resource for churches is now available on CCOW’s Refugees and Forced Migration webpage. 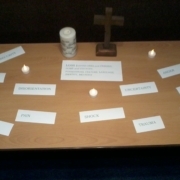 With the kind permission of the Reverend Ben Kautzer, we have full materials for a prayer service, including prayer stations, a liturgy, reflections, and more. 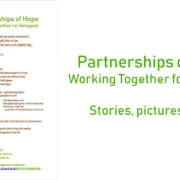 We also have an account of how these resources have been adapted and used in two different contexts – Didcot Baptist Church’s evening prayer service on 2nd December and CCOW’s Day of Reflection on 26th January – and the supplementary materials from those events Why not hold a similar event at your local church, to help people increase their empathy with the experience of refugees and be challenged to respond? Asylum Welcome needs good condition bikes of all types and sizes. Bikes improve the lives of asylum seekers and refugees living in Oxford: cycling is a free, green and easy way to travel! Contact: bike@asylum-welcome.org to donate. 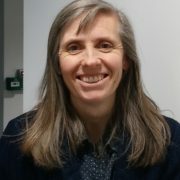 CCOW organised a useful communications training morning in December, led by Jillian Moody. 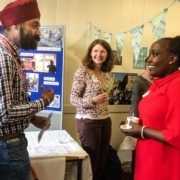 The event was attended by representatives from Refugee Resource, Connection Support, Haddenham Community Sponsorship Group, Blackfriars Community Sponsorship Group, Asylum Welcome and CCOW. Chorley Wood 4 Refugees is now sending one or more pallets of aid from London to Greece on a weekly basis. Each pallet can take 40 banana boxes filled with aid. They have negotiated a special rate so the cost of transporting each banana box from London to Greece is only £5. If any individual or group would like to take advantage of this palletisation programme, email briandonnelly04@gmail.com. Churches Together in Marlow are offering Lent study groups which will follow the USPG Study Course on Migration and Movement. Faringdon Refugee Support Group and Host Abingdon are now together providing ongoing support for the 8 Syrian families who came to the Vale of White Horse and South Oxfordshire under the government’s Syrian Vulnerable Persons Resettlement Scheme. Could you help with finding employment, give financial support (e.g. for driving lessons, bus passes) or volunteer as an English teacher, family support volunteer, volunteer co-ordinator or translation support? Contact Sue Colclough hostabingdon@gmail.com for more information. Members of the Headington (Quaker) Meeting have been undertaking a variety of activities relating to asylum seekers and refugees. The meeting itself holds a weekly food collection for Asylum Welcome and supports Oxford Friends Action on Poverty. 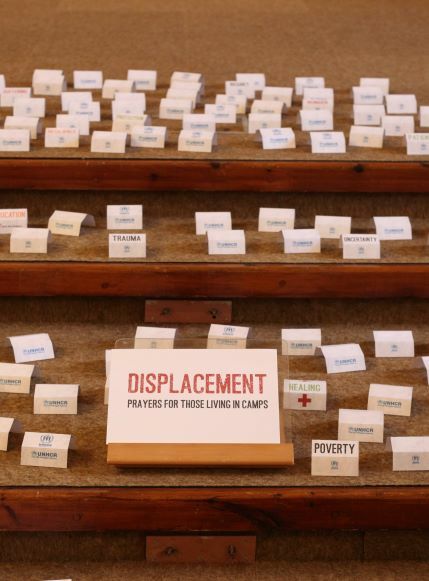 Individual members have engaged in activities such as mentoring with Refugee Resource, supporting refugees through Sanctuary Hosting, and serving as part of the Quaker Asylum and Refugee Network and the Bail Observation Project. In February the volunteers of Reading Refugee Support Group, founded 25 years ago, were nominated for The Queen’s Award for Voluntary Service. The Women’s Service of Refugee Resourceheld their fourth Pop Up Cafe on 16th January, in collaboration with Syrian Sisters and Asylum Welcome. Guests were Syrian families and elderly people living in Witney. Wycombe Refugee Partnership are looking for someone to help refugees register for Universal Credit. A new Application Form for Community Sponsorship was introduced by the Government in December. It replaces the previous Resettlement Plan and Application Form. Sponsor Refugees (Citizens UK) has produced a Welcome Pack Template for Community Sponsorship groups to use with their refugee families. The template, which gives a framework for presenting information on a variety of key areas such as housing, emergency services, transportation, employment, and schools, has material in both English and Arabic. Migration and Movement is a six-session study course produced by USPG (United Society Partners in the Gospel). A good discussion starter for small groups, it blends Bible passages, stories and facts from around the world, and discussion questions. On 19th December 2018 the UK Government published an Immigration White Paper “The UK’s future skills-based immigration system”. Read the Refugee Council’s response including their comments on detention, family reunion, employment and ESOL provision. TheImmigration and Social Security Co-ordination (EU Withdrawal) Bill is currently going through parliament. The UN Global Compact for Safe, Orderly and Regular Migration was adopted in December. Find out more about it from this podcast, which summarises its history and content and offers analysis. When a person is recognized as a refugee in the UK, they have just 28 days before their financial support stops and they must leave their accommodation. For many this is not long enough and they risk becoming destitute. The British Red Cross have produced a report “Still and ordeal – The move-on period for new refugees” and is calling on the length of this move-on period to be increased. Sign Amnesty International’s petition to the Home Secretary to make the rules on refugee family reunion less restrictive. Currently child refugees in the UK are unable to sponsor their close family to to join them. Similarly the children who are over 18 or elderly parents of refugees in the UK are unable to join them. 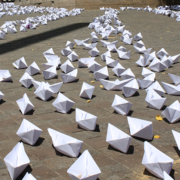 Call on the UK government to end indefinite detention. Join MPs from all parties and others calling for a 28 day time limit on immigration detention. See the report by the Joint Committee on Human Rights for more information. Sign the online petition to restore language support for UK driving test candidates. Until 2014 translation was offered. But now many refugees whose international driving permits have expired but whose English is not yet good enough to pass the UK test are banned from driving. This is a serious obstacle to their integration, particularly as they seek work. Email your MP asking for all unaccompanied children to be supported by an independent guardian to help them access their rights. Many have experienced or are at risk of trafficking. With the Modern Slavery Act under review, support this campaign now.